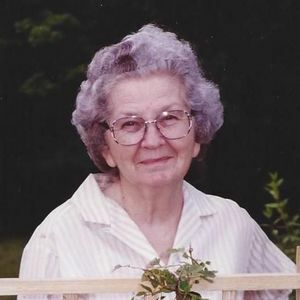 GREENVILLE- Joyce Dean Todd Chappell, 89, of Greenville died Saturday, March 12, 2016 at her residence. Ms. Chappell was a retired florist and member of Greens Chapel General Baptist Church, where she served as church secretary. She also was the church pianist for 30 years. Ms. Chappell enjoyed quilting, bible study, keeping records and chocolate. She is preceded in death by her husband, Ted Chappell; sons, Larry and Jerald Chappell; and brother, Joe Glen Todd. Survivors include her grandchildren, Kim (John Mark) Pendley, Ronda (John Mark) Sweeney, Jerri (Brian) Groves, Jon (Lisa) Chappell, Amanda Chappell; great-grandchildren, Kolton Rice, Shelby, Jon Thomas, Jack, and Miranda Chappell; daughters-in-law, Glodean Cottongim and Judy Lear, both of Greenville; special caregivers, Doris Cook, Earletta Robinson, Kim Saulsberry, Tammy Wright. Funeral services will be held Wednesday, March 16, 2016 at 11:00 AM at Tucker Funeral Home in Central City with Rev. Walter Evitts officiating and Rev. Jeremy Teague assisting. Burial to follow in Greens Chapel Cemetery in Greenville. Visitation will be Tuesday, March 15, 2016 at 5:00 PM at the funeral home. Online condolences can be made at www.tuckerfuneralhomes.com. The beautiful and interactive Eternal Tribute tells Joyce 's life story the way it deserves to be told in words, pictures and video. My father Bill Inman was cousins with Theodore (Ted) Chappell, And through him we knew Joyce. Whenever we traveled across the country we always went to visit with Joyce. the last time we were in Kentucky in 2010 we had a wonderful visit with Joyce, Pearl (Dad's sister) and dad. Joyce was always welcoming, remembered my name and was sweet and loving. She is one of the few memories that dad carries to this day. We surprised Joyce that day, knocking on her door then walking around the back and she surprised us... She was out working in her yard. She is a light and a beautiful example of grace and Christ like love. Her hug enfolded me completely as she professed her gratitude to me for bringing "Bill back home". Now she has gone home to heaven to have a joyous reunion with her boys. She blessed the lives of all who knew her. What an amazing lady and friend! She always made me feel so special. How fitting that she started her eternal life in heaven while the earth is springing forth with blooms and buds - it's as if God has given me another memory 'til I see her again. I will miss her terribly. Prayers and thoughts go to her family. We offer condolences and thoughts of comfort at the loss of Joyce to all the family. It is a sorrowful time now yet we remember her in life and know that she is sharing her sweet smile with angels and friends in heaven. Our family enjoyed the time with Joyce. She was thoughtful and caring. She made our lives better for having her in them. So sorry to know that Joyce passed away. But I am glad to that she is in a better Place and enjoying herself. I can imagine what she and Mom are having a good time.